Valid for 1 month from training. Subject to terms and conditions, please refer to the voucher or ask for more infomation. Learning the art of beekeeping is a fascinating past-time, but beware it can become addictive from the very first time you open a hive and peer inside! It is an interest that can just keep growing, as you begin to understand more and more about how these little insects work as an incredible and complex colony there is endless knowledge to gain. Bees are under threat and need our help to survive, by understanding the behaviour and instincts of the honey bee along with their needs and the problems they are encountering you can help a vital part of our environment. The trainers are very knowledgeable with a lot of great advice you can't read anywhere else!! Great food and lovely couple & farm! Beee-autiful! Great training!! Amazing tutors who covered a pretty extensive range. Thank you. Very easy to book with clear information. Good handouts and excellent food. 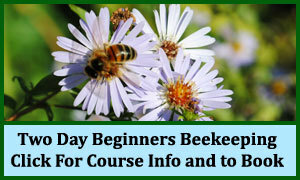 The trainer was very knowledgeable and has been able to provide a very in depth explaination on how to keep bees. Great course, very well worth all the time and money. I am very happy with the training and the nice touches made by the owners to look after us all weekend. Will highly recommend. Thank you. Excellent training courses Thoroughly enjoyed the whole weekend. Expert beekeeper gave me all the knowledge I need to start keeping my own bees. 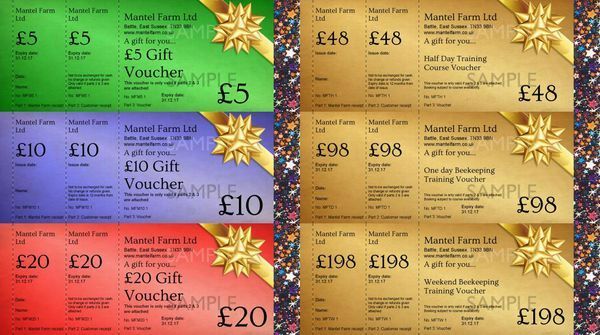 Well done Mantel Farm. In the UK about 70 crops are dependent on, or benefit from visits from bees. In addition, bees pollinate the flowers of many plants which become part of the feed of farm animals. The economic value of honey bees and bumble bees as pollinators of commercially grown insect pollinated crops in the UK has been estimated at over £200 million per year. Bees are in danger of disappearing from our environment. Farming practices continue to disturb the natural habitats and forage of solitary and bumblebees at a rate which gives them little chance for re-establishment. The honey bee is under attack from the Varroa mite and it is only the treatment and care provided by bee keepers that is keeping colonies alive. Most wild honey bee colonies have died out as a result of this disease. Bees are some of the hardest working creatures on the planet, and because of their laborious work ethic, we owe many thanks to this amazing yet often under appreciated insect. Our lives - and the world as a whole - would be a much different place if bees didn't exist. To illustrate this fact, consider these numbers: bees are responsible for pollinating about one-sixth of the flowering plant species worldwide and approximately 400 different agricultural types of plant. Entitles the bearer to book a place on a £48 training course. Simply purchase through our website to redeem in our shop. Entitles the bearer to book a place on one of our £98 training course. Simply purchase through our website to redeem in our shop. Entitles the bearer to book a place on one of our £198 training courses. Simply purchase through our website to redeem in our shop.